Prayer beads have been an established part of spiritual practices for thousands of years, found in both the East and the West. In the most practical sense, they allow one to keep track of long series of prayers or mantras. In a mystical sense, they talismanically embody the very prayers said over them. In the West, prayer beads have largely taken the form of the Rosary (Mary/Christ) and Chaplet (Saints/Angels) – employing a sacred symbol and the medallion of a Saint along with colored beads. 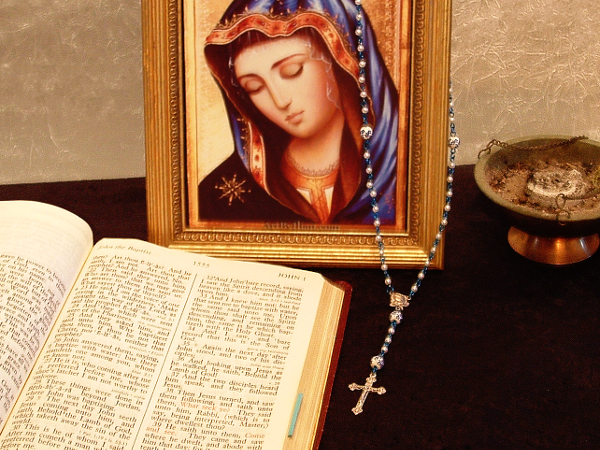 Though Christian in origin, the beauty and simple practicality of the Rosary and Chaplet has seen it gain popularity even outside of Christianity. We offer a variety of beautifully hand-crafted Rosaries and Chaplets for several traditions: Christian, Gnostic, Neopagan/Wiccan, Gnostic-Voudon, etc. Each is consecrated by an ordained priest during a mass, and comes with the prayers intended for its use. Select your Rosary or Chaplet material below (plastic, rosewood, or glass beads). Then contact us to let us know if you want a Rosary (Mary/Christ) or a Chaplet (Saint, Angel, Deity), along with your desired colors (for plastic or glass beads). If you want a custom design, just contact us before you order below.